The FCC has announced its proposal to impose a fine of $37.5 million on a company accused of making robocalls and hiding the calls’ origin behind the real phone numbers of consumers. The agency is attempting to show that it’s cracking down on the out of control robocall industry, but critics say it’s too little, too late. Spoofing is the term for using various techniques to display a different phone number on a robocall target’s caller-ID than the number that’s actually being used by the caller. What makes the Affordable Enterprises case different is that it’s accused of intentionally using phone numbers that belong to consumers. This makes it hard to file a complaint against the company and leads to confused Americans fielding angry phone calls out of the blue. The press release cites one innocent woman in Arizona who averaged more than five calls on her cellphone each day from people demanding that she stop calling them. “This is the Commission’s first major enforcement action against a company that apparently commandeered consumers’ phone numbers,” the FCC said. Earlier this month, First Orion, which provides caller-ID and call-blocking services, published a study that found telemarketing spam had increased from 3.7 percent of calls made in 2017 to 29 percent in 2018. That number is expected to rise to 45 percent next year, according to the company. Not only sowa this annoyance that makes people never want to answer their phones, but these operations are often running fraudulent schemes designed to trick consumers into giving up personal information. For example, if you receive a phone call saying that there’s been unusual activity on your bank account and the number displayed on your caller ID matches the number on the back of your debit card, you’re far more likely to trust the caller. Spoofing isn’t always illegal, but when it’s done with “the intent to defraud, cause harm or wrongly obtain anything of value,” it can carry the penalty of a fine of up to $10,000 for each violation under the Truth in Caller ID Act. In the case of Affordable Enterprises, the $37.5 million fine is just a proposal that comes with a notification to the company of how they’re believed to have violated the law. More formal legal proceedings or a settlement could follow. On the same day that this first-of-its-kind notice was released, the FCC also said that it will impose an $82 million fine on a telemarketer named Mr. Philip Roesel. He’s accused of operating companies that made over 21 million robocalls to market health insurance. In that case, generic spoofing to mask a number, rather than using known consumer phone numbers, was said to be employed. Roesel has disputed the charges. In a statement accompanying the announcement, FCC Chairman Ajit Pai bragged that under his leadership the FCC has “voted on measures to fight the scourge of unlawful robocalls” at almost half of its meetings. Pai is widely perceived to be far more friendly to big business and telecoms than his predecessor under President Obama. The simultaneous increase of robocall volume and efforts to lobby the Trump administration for more friendly treatment of the practice gives Pai plenty of motivation to make a flashy example of some bad actors. 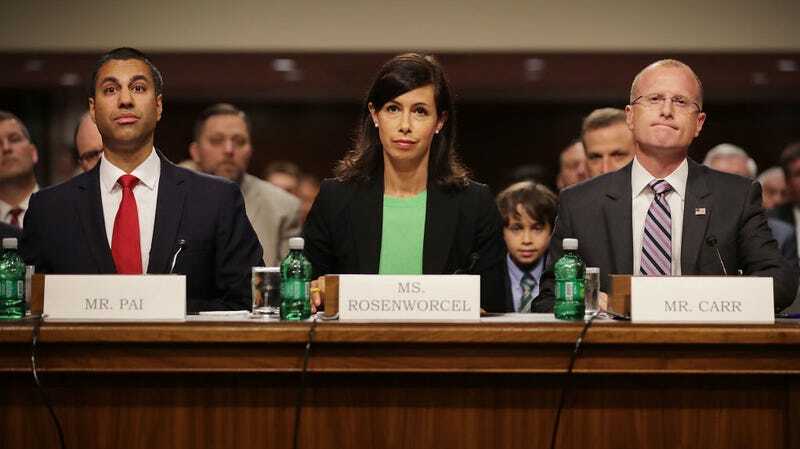 Pai’s colleague at the FCC, Commissioner Jessica Rosenworcel, wasn’t impressed by Wednesday’s announcements. “It’s great that this agency is issuing a forfeiture order and notice of apparent liability today,” she wrote in an accompanying statement. But she argued that these individual actions are akin to “trying to empty the ocean with a teaspoon.” She called for a renewal of the Robocall Strike Force that released a plan for targeting robocallers in 2016 that left many observers unsatisfied. She also said the agency should move forward with policy implementing the STIR/SHAKEN authentication technology that’s been proven to reduce the volume of robocalls.